Alabama singer, Jimmy Ellis, was born with a remarkable voice. Jimmy's voice is remarkable because it sounds exactly (exactly) like Elvis Presley. Documentary Orion: The Man Who Would Be King (Orion) tells Jimmy’s amazing and bizarre story. Directed by Jeanie Finlay, this film looks at Jimmy's struggle to make it in the music industry and explores how one crazy idea, in the aftermath of Elvis' untimely death, turned his vocal talent from a blessing to a curse. Click Here And Subscribe To 500 Days Of Film! I have to admit that, before I watched this documentary, I had never even heard of Jimmy Ellis. I had, of course, heard of the Elvis Is Alive myth and had always wondered just how (and why) this myth had been created. Orion: The Man Who Would Be King uncovers not only how the myth started (with the novel Orion by Gail Brewer Giorgio) but also explores how the fantasy grew to become a lasting, global phenomenon. Following Presley’s death, demand for his albums reached record (hysterical) levels. Sun Studios Producer, Shelby Singleton, saw an opportunity to transform Jimmy into the mysterious Elvis-like figure, Orion. By using Jimmy's remarkable voice, Singleton hoped to cash in on the musical vacuum left by The King. Orion: The Man Who Would Be King is a gripping film. I found myself totally and utterly hooked by Jimmy's story - both because of the intriguing strangeness of his situation and also because there is such deep sadness within his story. For example, Jimmy was contractually obliged to wear a mask when performing. This was all part of Singleton's plan to encourage an air of mystery about the singer. And it worked. Thousands of people soon clamoured to see the man who sounded so much like Elvis. Many, so devastated by the loss of Presley, were willing to believe the fantasy that Jimmy was, in fact, Elvis. Jimmy hoped that this audience would come for Elvis and stay for him. However, unable to remove the mask, he began to feel trapped. After all he did not set out to impersonate Presley - he just happened to sound like him. He wanted to be recognised as a singer in his own right. Finlay uses audio recordings with Jimmy and on camera interviews with his family and friends to uncover the truth about Orion. And we discover many fascinating things about him. For example, he performed with Kiss at a concert in Germany. However, despite the bizarre nature of this tale, the documentary left me with a feeling of sadness. Jimmy wanted to make it in the music industry. He wanted fame and the all trappings of success. He wanted his own talent to be recognised. Tragically, fame, for Jimmy, came at a cost: anonymity. He grew to hate the mask that he was forced to wear and the remarkable voice he had been blessed with also became a curse. The idea behind this documentary was born when director, Jeanie Finlay, was at a garage sale with her husband in their hometown of Nottingham, England. On a stall alongside cheap ornaments and second hand books, Finlay discovered an album called Orion Reborn. She was instantly fascinated and desperate to find out more about the man in the mask. 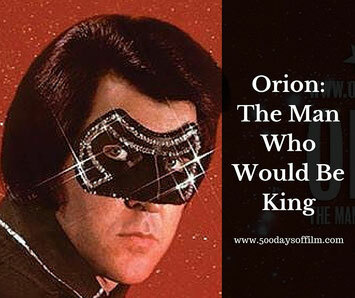 Have you seen Orion: The Man Who Would Be King? If so, what did you think of this documentary? I love documentaries and I'm always looking for recommendations. Thanks, Jane! Hi Jay, Thanks for stopping by! I just love documentaries too. I hope this list is helpful. Do let me know what documentaries you enjoy!